The Last Camp of General Lee | slate river ramblings . . . .
Less than two miles from Buckingham Courthouse, there stands a white oak tree, even now not more than a foot in diameter, under which General Robert E. Lee camped the night after his famous battle at Appomattox. The second night he stopped at the house of his brother, Mr. Charles Carter Lee. When he left the tree near Buckingham Courthouse, he left it never to camp again. It stands about one hundred yards from the house of the late William Shepherd, a good old Virginian, who then owned the land. 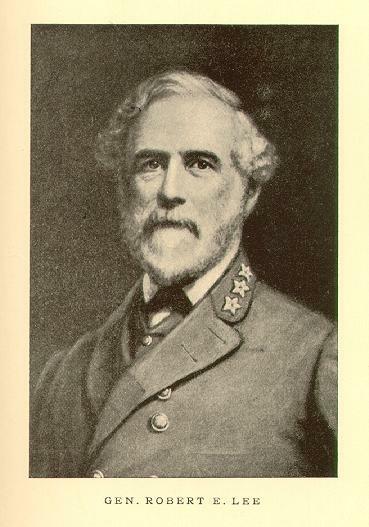 Mr. Shepherd, with true hospitality, invited General Lee to spend the night at his house. The General thanked him but stated that he believed he would camp with the boys; his staff accompanied him. The weather was comparatively warm and pleasant. As he composed himself to rest upon this, his last camping ground, who can fathom his thoughts? . . .
Patteson’s reverie covered most of four columns and, in the end, he came back to the oak. The tree in Buckingham to which I have adverted, was called to my attention by my friend and old comrade, Judge George J. Hundley, as gallant a Confederate soldier as ever drew a blade in defense of constitutional liberty. We went into the army at the same time; we are about the same age, and belong to the same profession. He knows the tree well which I have described, and it was mainly at his request that I have written this paper. Old Confederates like us must be allowed the “garrulity” of age. All that we can do, like that old veteran described in that famous work, “Old Mortality” written by Sir Walter Scott, is to re-write the inscriptions upon the tombstones of the past, and try to keep green and fresh the memory of the cause we loved so well. Hi….I believe that George Shepherd, Sr. or George Shepherd, Jr. donated that piece of land for a park in honor of Lee/Encampment. At the moment, I can’t remember which person donated the land. I find this to be interesting for many reasons, but one in particular, is the fact that this land was donated via People of Color….donating land ref the Confederacy….I have a feeling that this family witnessed Lee’s last stand…..
Any information as to exact location or if this tree still exists? Buckingham County: Lee’s Last Camp | slate river ramblings . . . .